Zet processor is an open implementation of the so widely used IA-32 architecture (generally called x86). This project can be synthesized in a configurable device such an FPGA or CPLD, or made as a custom ASIC. Five different FPGA boards are currently supported. 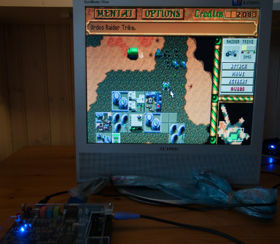 Playing Dune 2 in MS-DOS running on the Zet Platform. See some other Pictures. This project is quite complex and is in a very early stage of development. Only the 16-bit part (ie. the 8086/80186) is supported, see Zet status for more information. It can boot successfully MS-DOS 6.22, FreeDOS 1.1 and run Microsoft Windows 3.0 and other MS-DOS games. If you have one of the boards mentioned above, you can just try it by following the simple steps shown in the Installation guide. It's very easy and straightforward!! 22-Dec-2013. We are now accepting donations in Bitcoins for the Zet open source development and the website maintenance. Thanks for your kind support! 19-Nov-2013. New release version 1.3.1 that fixes the BIOS compiled binary included in the previous release package. 4-Nov-2013. Version 1.3.0 released! We have a new board, the Altera DE2 and the video memory has been placed on SDRAM, making the DE0 able to run Windows. You can see the complete change in the forums post. You may want to browse the source at github. This page was last modified on 15 November 2016, at 11:18. This page has been accessed 683,367 times.